This is likely the final week of the 2019 legislative session. 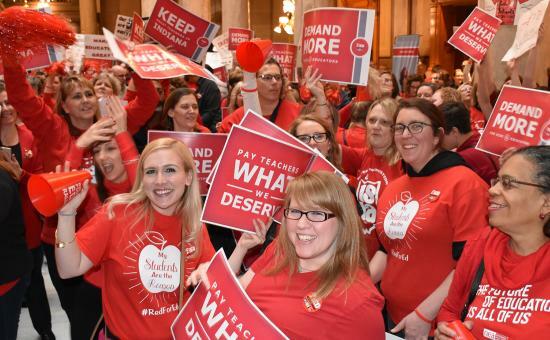 Let’s use the week to promote the Red For Ed movement to support funding for every student, support staff member and teacher. Now is the time to push for more school resources for classroom instruction and fair compensation. On Earth Day, use ISTA’s advocacy Action Center to write your legislator about HB 1001, the budget bill. Tell them how the lack of funding impacts you, your students and your community. Field trips aren’t just for students! Recruit a group of educators to participate in ISTA's last Day of Action for the legislative session. Show your community that educators, parents, students and administrators collectively support more education funding. Host a school walk-in. Remember to wear red! Leverage social media today. Share your #ThursdayThoughts on why public schools need more resources and educators need competitive salaries. Tag @ISTAmembers, your legislator and use #InvestInEducationIN. Submit a letter to the editor. Write a letter to the editor of your community paper from yourself or from your colleagues. Ask for your community's support. Want to learn more about ISTA’s efforts to increase funding for public schools, visit InvestInEducationIN.org.